This page is under construction. More pictures will be added. Here are the few items I have obtained, which were used in 2001: A Space Odyssey. 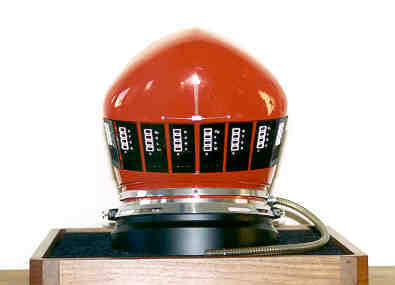 Dave Bowman's red space helmet. 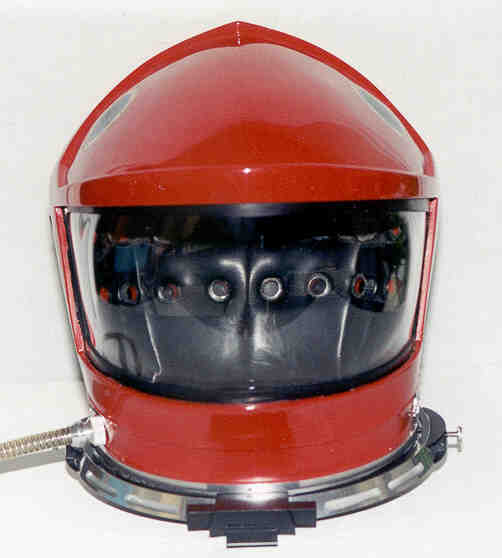 This is the red helmet worn by Keir Dullea as Astronaut Dave Bowman in the film. These images are after restoration of the helmet. See the 2001 Spacesuit Restoration Project for description of the helmet restoration. 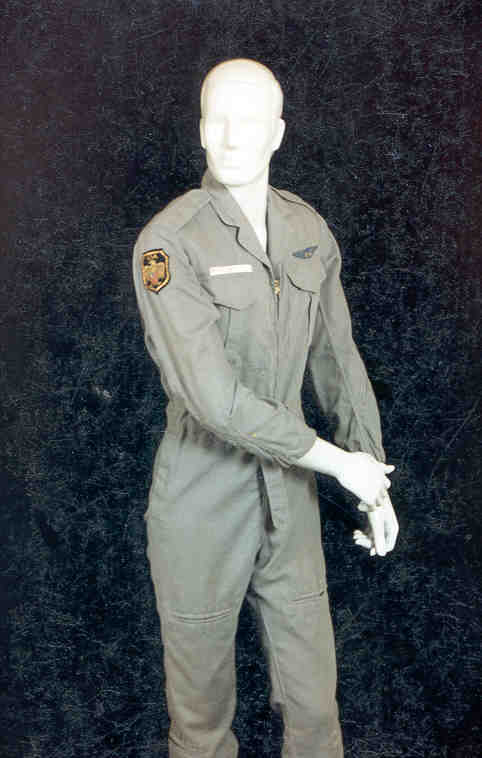 These are the coveralls worn by Keir Dullea as Astronaut Dave Bowman in the film. They have a label inside marked with Dullea's name and the size. Spacesuit Boots from Frank Poole's yellow spacesuit. 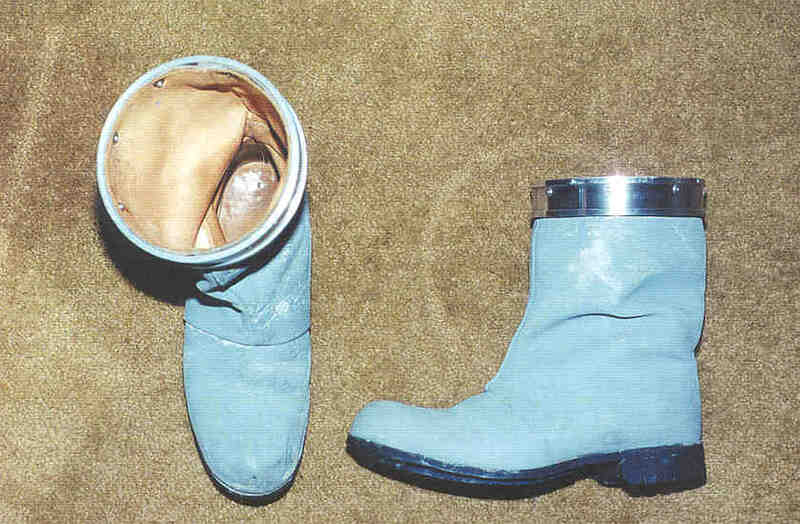 These are the boots worn by Gary Lockwood as astronaut Frank Poole in the film. They are marked on the inside with the manufacturers initials and marked "G. Lockwood" and " MGM". Neckring (helmet side) from one of the white helmets. This is a neckring from one of the white helmets used in the TMA-1 excavation scene. Sun Visor from one of the white helmets. The final design of the white helmets kept the internal sun visor from the early helmet designs. The helmets were built with the sun visor, however it appears that the sun visors were removed from the helmets before filming as they are not seen in the film. The Discovery spacesuits utilized a electro-optical shade activated by a button on the arm of the spacesuit. This effect was done without any of the digital effects in use today, because they did not exist when the film was made. This effect was achieved in the film via the use of polarizing filters. One filter was placed on the helmet visor and one in front of the camera lens. The automatic darkening effect was achieved by rotating the filter in front of the camera lens through 90 degrees. The polarized light from the faceplate of the helmet (ie the astronauts face) was progressively blocked by the rotating camera polarizing filter. Light from the rest of the image (suit, etc) was not effected since it was not polarized. The effect is very simple and extremely effective. You can see a bright reflection off of Bowman's eye that is darkened but not eliminated, just as would happen with a real electro-optical filter. 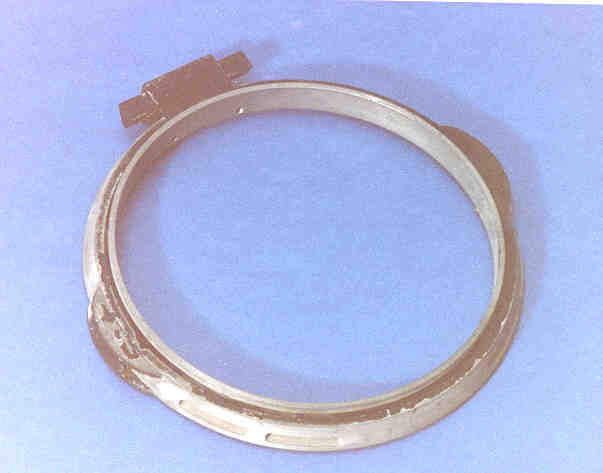 Connector from the chest pack of one of the silver lunar suits.